iPhone data recovery, iPhone photo recovery, iPhone data recovery software, ios data recovery, iPhone s, like iPhone, iPad and iPod touch. With it, you can retrieve up to 12 types of data, such as taken photos and videos, messages, contacts, notes, etc. Leawo iOS Data Recovery is the comprehensive iOS data recovery software that can recover deleted, formatted and damaged camera roll photos and videos, photo stream photos, photo library images, contacts, call history, text messages, message attachments and many more data files from your iPhone, iPad or iPod touch. This iPhone data recovery fully supports iPhone 5, iPad 4, iPad mini, iPod touch 5 and many other Apple devices. Did you get panic when lost all the data in your iOS device due to a failed jailbreak, upgrade or restoring to factory settings? 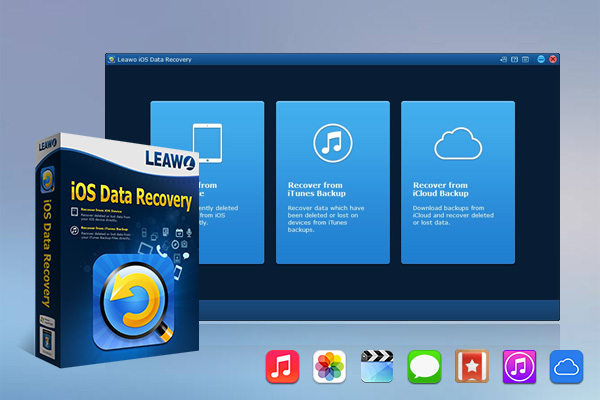 Don't worry, Leawo iOS Data Recovery tool is the best solution for data loss caused by different reasons. It supports many kinds of data types and formats output by two optional recovery modes. Using the first mode "Recover from iOS device", you can achieve iPhone data recovery, iPad data recovery and iPod touch data recovery by directly scanning and analyzing the device even when you have no backups. When your device is broken or lost, the program can also help you recover by extracting previous iTunes backups using the second recovery mode. 1. Support iPhone 7/7 Plus. 2. Support to recover data for iOS10. 3. Improved stability. from iTunes backups. You can achieve iPhone data recovery, iPad data recovery and iPod touch data recovery quickly and safely by deep scan and analyzing of the device or by extracting previous iTunes backups.